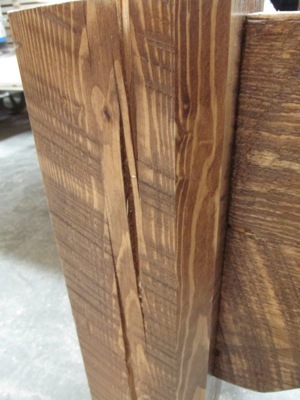 "Season Checking" or cracks are a natural characteristic of all rustic furniture. Season checking happens naturally during the drying process of the logs or timbers. 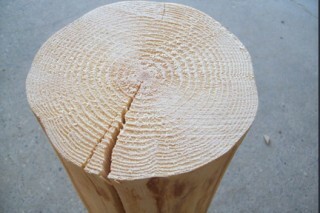 These cracks or season checks, will vary from log to log and from timber to timber. Some cracks will be wider than others. Some will be hardly noticable at all. 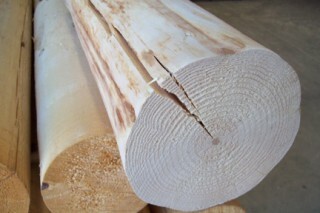 Typically, the larger the diameter of the log or timber, the larger the cracks and season checking will be. Season checking does not affect the structural integrity of the furniture. Season checking adds natural character and beauty to every piece of rustic furniture. Season checking tends to be radial, or from the center of the log, cracking outward in one direction only and often spiralling around the log or timber. Season checking very rarely cracks through the entire log or timber. Our logs are thoroughly dried before the building process begins, which is needed to build quality log style furniture and homes. Drying allows the logs to achieve normal cracking, which yields maximum strength and quality for log furniture or log cabins. 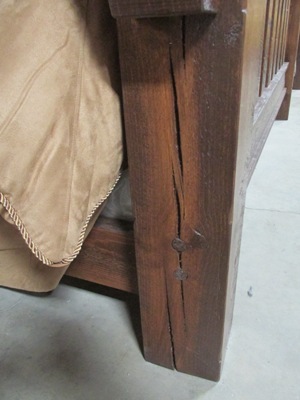 Some additional minor cracking especially in dryer climates again is perfectly normal of a natural hand-crafted piece of furniture.